The perfect secluded setting for a relaxed and private experience with family or friends. Nestled into the jungle and set in an area of 1,140sqm, this modern house provides some of the best sea-views available in Phuket. 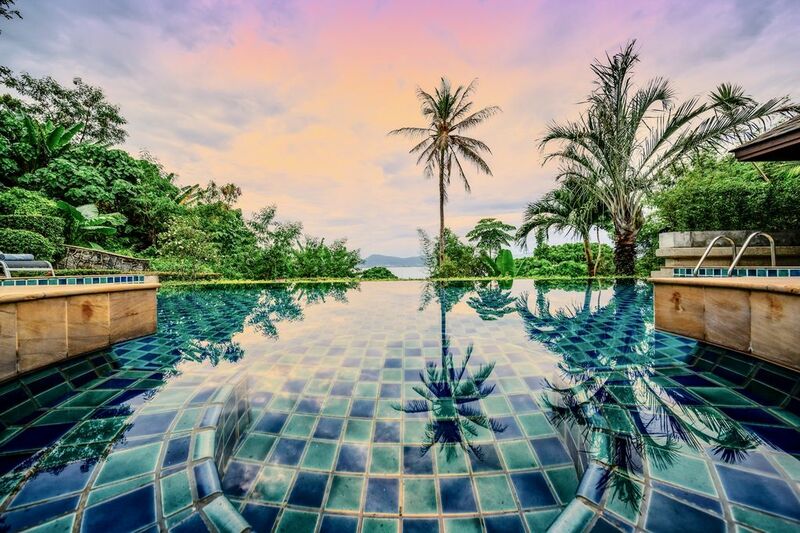 Located on a small peninsula, the villa is just a few minutes walk from two beautiful beaches; Ao Yon (east-facing) and Khao Khad (west-facing). Both beaches are in sheltered bays making them perfect for swimming all year round. With six bedrooms, five en-suite bathrooms, guest WC, outside shower, Thai and western kitchens, large open plan living space, a private swimming pool, garden, carport and terrace, this high-end villa is spacious and can comfortably accommodate up to 20 guests (16 adults). The private and romantic setting with stunning views across the bay makes it a perfect location for a special event. We've hosted a number of weddings and other events at the Glasshouse and can help with any special arrangements. The exterior of this architect designed home is set among landscaped gardens with a 10m infinity pool with jacuzzi as the centre piece. A Thai style sala is the perfect place to shelter from the sun or enjoy a glass of wine as the sun sets across the bay. The interior of the home is equipped with high quality locally sourced furniture and fittings that will make your experience a luxurious one. Whilst in touch with the surrounding nature, the house is equipped with high-speed wireless internet throughout, multi-room sound system, 50' TV/home theatre. Living Area: The spacious open planned living space with panoramic views of Chalong bay spans the entire width of the property and opens directly on to the pool terrace and sala. It includes a dining area, accommodating 16 for formal dining, a TV den with state of the art audio-visual entertainment system and a double height sitting area. The open design merges with the pool terrace making it ideal for informal, al fresco eating, entertaining or just relaxing. The living space extends upstairs where we have a full-sized table tennis table, an office desk in case you have to work and an outside balcony with a circular day bed. Perfect for meditation, reading or a place for the kids to play. An open-planned European style kitchen is fully equipped with a full range of brand-name appliances including Smeg gas range, espresso machine, juice blender, microwave and American size double door fridge-freezer with ice maker/dispenser). An adjacent Thai kitchen with Smeg gas stove complements the interior space. Breakfast bar with marble top provides an additional social hub. Outdoor Space: The house is set among landscaped tropical gardens connected by stone pathways and dotted with several terraced areas. The 10m infinity pool is the centrepiece and includes a jacuzzi for the ultimate indulgence, day or night. Loungers on the poolside are perfect for soaking up the sun or move to the Thai style sala with its sofas and coffee table for some shade. The sala has speakers wired to the multi-room sound system so that you can enjoy chill-out music by the pool, or perhaps something more lively with cocktails as you watch the sun go down. An outside barbecue provides another option for dining/entertaining. Outside seating includes; 8 poolside loungers, sofa for 6 in the sala, 4 bar stools. The Cape Panwa area of Phuket is perhaps one of the island's best-kept secrets. The villa is situated on a small peninsula and close to two separate beaches, each just a few minutes walk away. Khao Khad is 1-2 minutes walk from the villa with nearly 1km stretch of beach. It’s undeveloped with just a few beach bars and restaurants. Most guests prefer Ao Yon beach which is 2-3 minutes walk and is also quiet and undeveloped. Both beaches are relatively sheltered and don’t have the high waves and rip tides that the west coast beaches experience. All the essential amenities you need to make your stay convenient, comfortable and indulgent are just a short walk away. There’s a 7-11 convenience store just 30 metres from the Glasshouse and a Family Mart is about 250 metres away. Both are open 24 hours, have an ATM and a wide range of products including drinks, ice, snacks, confectionary, ice cream, toiletries and other essentials. They also sell alcohol during permitted hours (11am-2pm, 5pm-midnight). The nearest outdoor food markets are in Borae, a nearby village. One is open all day and the other, slightly closer and more interesting, is open late afternoon to early evening. These sell fruit, vegetables, fresh fish, meat & cooked food as well as Thai desserts and other local products. The nearest supermarket is about 5 minutes away in Makham Bay. Phuket attractions that are within 5-10 minutes of the Glasshouse include Phuket Aquarium, Ao Yon waterfall, Khao Khad Tower & Viewpoint and Tarzan Adventure. Water-based activities such as kayaking, sailing, snorkelling & diving start out from Ao Yon beach. Phuket's other attractions are scattered across the island and most places you'd want to visit are within a 15-45 minute drive. The big international style supermarkets in Phuket Central are about 15-20 minutes away. If there’s something very specific that you need, Central Food Hall at Floresta has a world-class range of imported products. The villa is always offered with exclusive use of the house, pool and gardens. We can accommodate up to 20 guests with a maximum of 16 adults. Children less than 2 yrs old don't count towards the maximum. Discounts are available for groups of up to 8 guests; please enquire. To encourage responsible use of aircon, we include an electricity allowance which is sufficient to run the house & pool with moderate use of aircon. Any electricity used over the allowance is charged at cost price +5%. Awarded Trip Advisor's Certificate of Excellence Award for 2018. I'm a physician from the U.K but have been living in Thailand for more than 11 years, based in Bangkok. A secluded home away from home that's perfect for gatherings of family and friends. To give guests maximum flexibility and in recognition of the reality of varying budgets, we offer the villa as self-catering with the option of adding additional services to meet your specific needs. These include a chef, maid service, nanny/babysitter service etc, on-site massage etc The private and romantic setting with stunning views across the bay make it a perfect location for a special event. We've hosted a number of weddings at the Glasshouse and can help with arrangements. Covered carport with space for 2 cars inside the grounds. Hi speed wifi throughout the villa including facility to stream your music inside and outside. TV with satellite and surround sound in living room. TVs in bedrooms 1, 2, 3, 5 to view your own content. Garden view terrace outside bedrooms 5 and 6. The villa is located between Ao Yon and Khao Khad beaches in the Cape Panwa area; probably the most exclusive part of Phuket. Away from the crowds in Patong and the other West Coast beach resorts, Ao Yon is in an idyllic setting with two unspoiled beaches approximately 100-200m of the Glasshouse. Both beaches are sheltered and don't have the high waves and rip tides that limit swimming along the west coast of Phuket. Water-based activities such as sailing, SCUBA diving, snorkelling, canoeing and day trips are all available from Ao Yon beach. We have a wide range of eating and drinking options within a short walk of the villa. Serving Western and Thai food, many of these have stunning beachside settings and range from low cost, local style bar/restaurants to more upscale eateries. There are numerous more restaurants within a 5-7 minute drive of the villa and it's easy to get a taxi to take you there and back. There's a 7-11 convenience store located just 30m from the villa where you can stock up on drinks, snacks or anything else you may need. A large supermarket and fresh produce market are each 5 minutes from the villa. Phuket Central is 15-20 minutes drive away with shopping centers (Tesco Lotus, Central Festival and Big C), countless restaurants, Phuket night market, a multiplex cinema, gym and other amenities. There are many more restaurants and street hawker food stalls within a 5-10 minute drive of the villa. Phuket is also famous for it's numerous beaches, nightlife, golf courses, island hopping, cabaret shows, elephant sanctuaries etc, all of which are within 15-45 minutes of the villa. Other nearby activities include Phuket aquarium, Ao Yon waterfall and Tarzan activity.